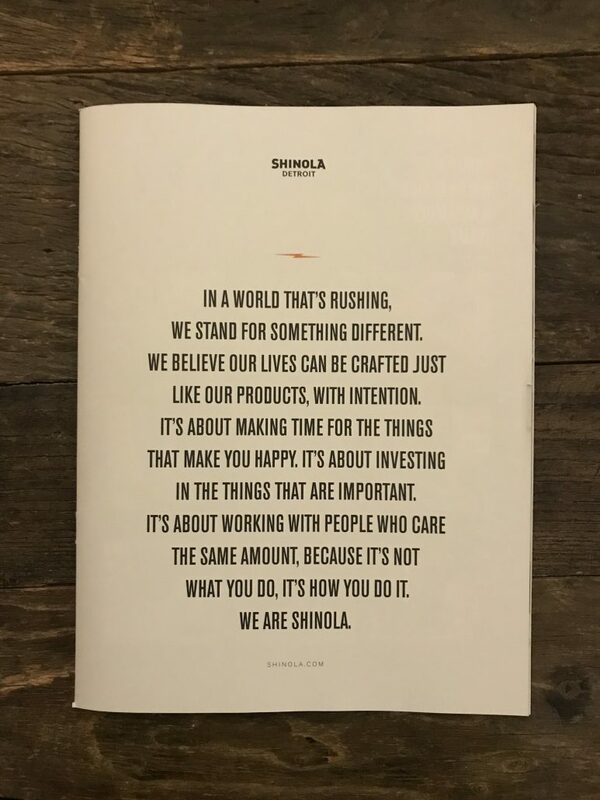 For years, I’ve been a huge fan of the Detroit-based watch maker Shinola. When their recent product magazine came out, my friend sent me a picture of one of the ads. It’s perfect. If you’d rather listen to this blog than read it, click play. Otherwise, Keep reading below. While yes, this is a product ad, it could also be a prescription for an amazing life. In a world that’s rushing, we stand for something different. I love this. Part of my personal practice is not using the word busy. I remind myself that there is always enough time and I choose how I use my time and what I prioritize. Our lives can be crafted, just like our products, with intention. We can choose to be intentional in how we craft our lives. With intention, we can create a career we love, we can make time for the things that matter. Drifting is not intentional. Going through the motions is not intentional. A life you love is possible and can be crafted, like a product, carefully. It’s about making time for the things that make you happy. What makes you happy? First, get clear on that. Then, priortize it’s presence in your life! Regularly! Investing in the things that are important. Investing doesn’t mean recognizing. It doesn’t mean complaining, disregarding or taking for granted. Invest your energy in what’s important. Invest your time. Invest your money. Check your attitude, my friend. Show up joyfully. Travel light. Be a creative, energetic problem solver.